A poem about art is like a painter wanting to write or a poet wanting to paint. The poem Musée des Beaux Arts is a glorification of the work of others, that’s something special isn’t it? That is what W.H. Auden did with this poem. On February 1907 Wystan Hugh Auden was born in York (England). His first book, simply called Poems, was a success. This book was published when he was only 22 years old. The poetry he wrote is stylistic and the technical achievement is impressive. After studying in England (Oxford) and Germany (Berlin), he worked as a teacher. Just before the war, in 1939, he moved to the US. Later he would become an American citizen (1946). There he worked also as a teacher. During the time he worked as a teacher, he still wrote. From the fourties the themes of his (longer) poems were more religious then before. In 1947 he would win the Pulitzer Prize in Poetry for the poem The Age of Anxiety. In this poem he described the world he lived in. At that time he had an affair with Christopher Isherwood. This was the most important reason for him to leave his home country. The relationship lasted, even after Auden had moved. It did not stop when he met Chester Kallman in 1939. The relationship was broken off by Kallman, when Auden wanted more than a casual relationship. They lived together in the same house from 1947 till the day Auden died. Auden was inspired by poets like W.B. Yeats and T.S. Eliot, but maintained his own style. Therefore it is still debated if he was influenced by these poets at all. In 1948 he decided to spend the summer in Europe and this would turn out to be a yearly ritual. At first he resided in Italy (Ischia) and later it was Austria (1958, Kirchstetten). In wintertime, he stayed in New York. In 1973 he died when he was visiting Vienna at the age of 66. He was buried in Kirchstetten. Interested in reading more about this poet? Then check out our webshop! 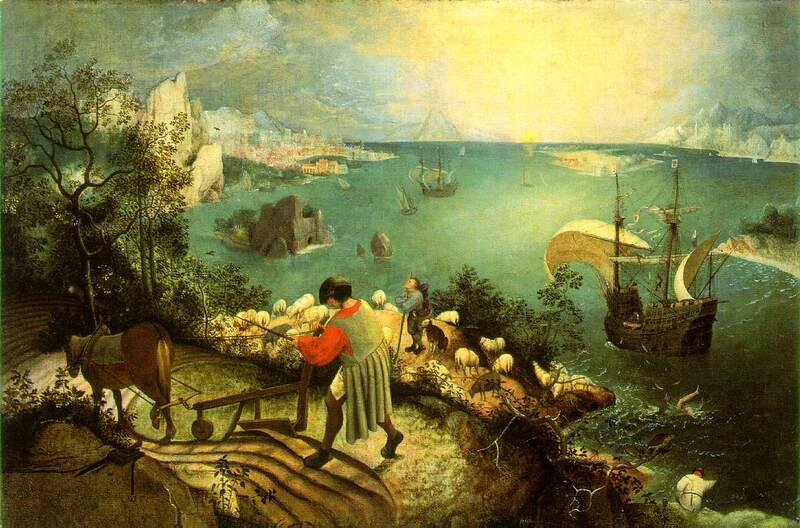 The painting by Pieter Breugel The Elder, De val van Icarus (Landscape with the Fall of Icarus) was an inspiration for Auden and the poets William Carlos Williams and Michael Hamburger. Little did they know that this painting by the Flemmish Breugel (not to be confused with his sons, who used the extra h in the name (Breughel)) that was on display in the Royal Museum of Fine Arts in Brussels (Belgium) was a copy. The original painting dates back to around 1560. As it turned out in the Nineties of the last century, that this was a copy, the painting was long considered to be one of the seven wonders of Belgium. The painting that is on display in the museum dates back to 1600. Breugel The Elder died in 1569. Still, the painting contains the techniques of Breugel. Therefore it's most likely, that this copy was painted at the time the original version still existed. It is assumed the original got lost (destroyed).